First 5 Images by Nacra 17 Sailing , full gallery here. Rest from the practice race held on Monday by Didier Hillaire / Yacht Club de La Grande Motte Full gallery at YCLM fb. Light winds today at La Grande Motte. Spis were not allowed on the upwind legs. Vote yesterday was close in favor of the limitation, as Nacra stated also that warranty would not cover such use for mast and spi itself. This vote was made only for this event as an ammed to sailing instructions. It is not a definitive rule change. On the water today Riley Gibbs & Louisa Chafee scored 2,1,1 but were later protested on them removing a rubber washer for the main foil top. Read details below on official report. 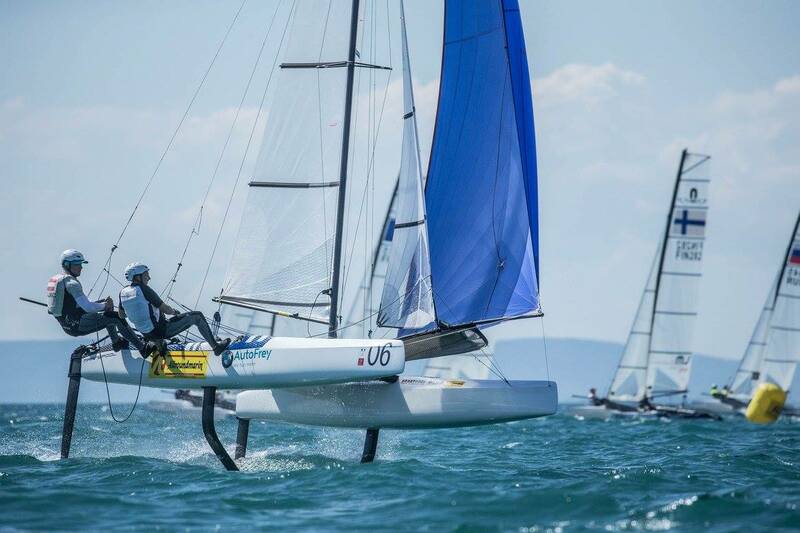 After the US team receiving the penalty John Gimson & Anna Burnet are now leading the first Nacra 17 MKII Worlds. Second place for another British crew, Ben Saxton & Katie Dabson and 3rd overall for Gemma Jones & Jason Saunders. Highlights perf of the day for Pablo de Fazio & Dominique Knuppel from Uruguay. Our neighbours crew coached by Andrew Mac Pherson had a great start with 5,3,5. Also more than happy for our own youth crew, been telling you that these kids are good. Mateo Majdalani & Eugenia Bosco received the MKII late in the delivery program schedule by the managed to adapt pretty well in the light conditions . Today it was floating upwind and foiling downwind. Much left, but good to see their potential. Current Olympic champs, also from Arg, Lange & Carranza are holding 9th overall with a good progressing score : 9, 7 & 3 for the day. American duo Riley Gibbs and Louisa Chafee lead the Nacra 17 World Championships after the first three qualifying races were contested in light, sub 10 kt breezes and pleasant sunshine off La Grande Motte’s Baie de Aigues Mortes. They were protested after racing for a measurement infringement and penalised, ceding the lead to Britain’s John Gimson and Anna Burnett. 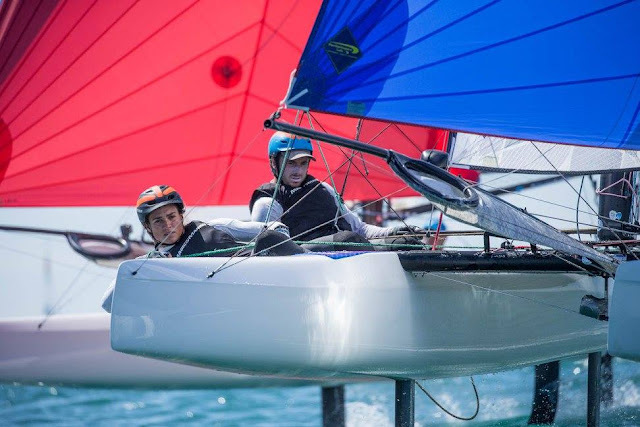 As if to answer the question whether the younger generation can make a big impression at these first ever foiling Nacra World Championships, foiling kiteboarder and 49er racer Gibbs, 21, paired with Rio Olympian Chafee, 25, had opened with an opening second and two first places from their 24 strong Blue fleet group and were credited with the provisional early lead of the championship. 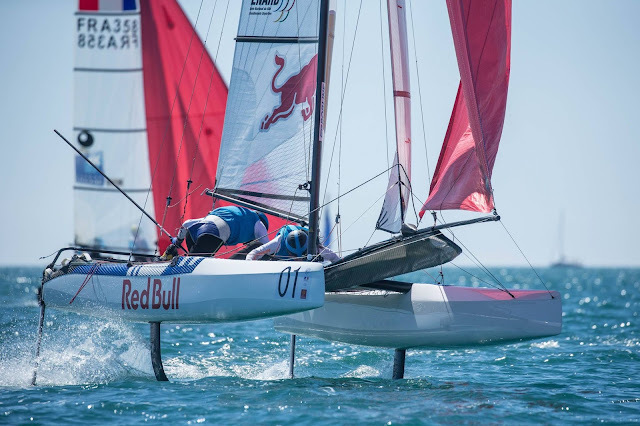 But they were subsequently protested and penalized for sailing with the rubber bushes at the top of the foils removed, contrary to the International Jury’s interpretation of the measurement rules. The young Americans, training partners of injured Bora Gulari and Helena Scutt who – Scutt reported after the hearing – had already trained with the bushes removed in order to preserve maximum strength in the head area rather than seek a performance gain were it to allow the foil to drop lower. “This is not about any performance gain this is about the strength in that part of the board.” Scutt emphasized after the hearing. “We had the boards not once, but twice, to measurement like that and so we considered it was fine.” Added USA coach David Howlett. With the young American pair receiving a 50 per cent place penalty for each of their races, John Gimson and Anna Burnett now lead a British Sailing Team 1-2 at the top of the World Championship standings with New Zealand’s Rio Olympians Gemma Jones and Jason Saunders in third. 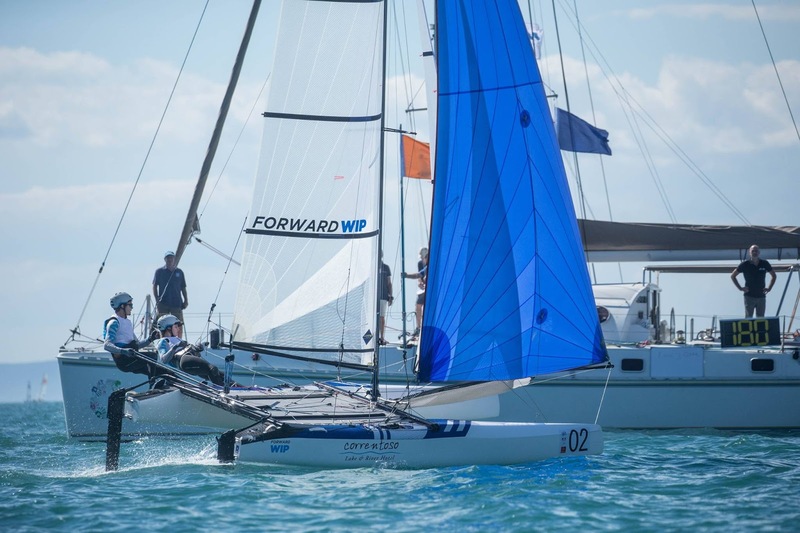 While several key groups have been working up on Lake Garda and here in La Grande Motte for example, the five strong British Nacra 17 squad have been training hard together as a unit on their native Olympic waters off Weymouth and Portland. 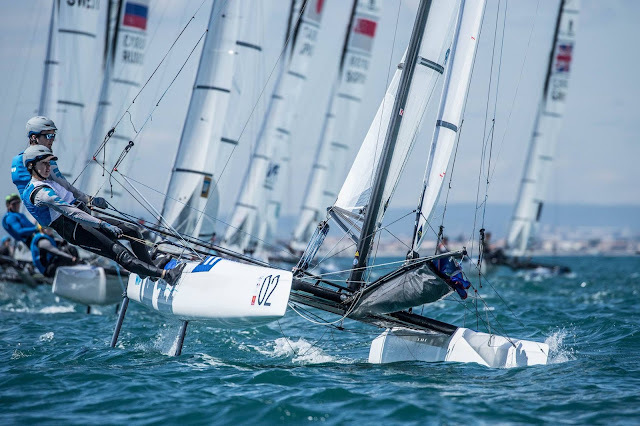 They showed well at the first foiling Nacra 17 event, the European Championship in Kiel where British Sailing Team crews took three of the top six places. Consistency in the light conditions on the opening day was not easy. Although the left on both course areas appeared to yield some profit in additional wind pressure there was some concern that the sea breeze might move to the right. 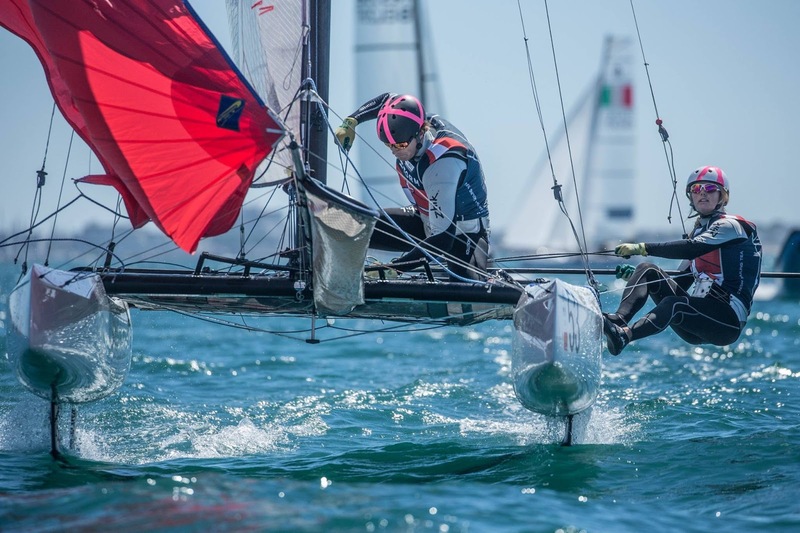 First blood on the Blue course went to Spain’s Iker Martinez and Olga Maslivets who lead to the first top mark ahead of Gibbs and Chaffee, the double Olympic medallist and Maslivets holding on to their early margin to the finish line. On the corresponding Yellow area Italy’s Lorenzo Bressani and Cecilia Zorzi – who, like Martinez missed out on Rio selection – also started out with a Race 1 victory. But Martinez and Maslivets struggled in the second race, rounded third from last, and had to fight back to a mid fleet 12th, going 1,12,9 for the day to lie 21st just behind Rio gold winners Lange and Carannza Saroli. 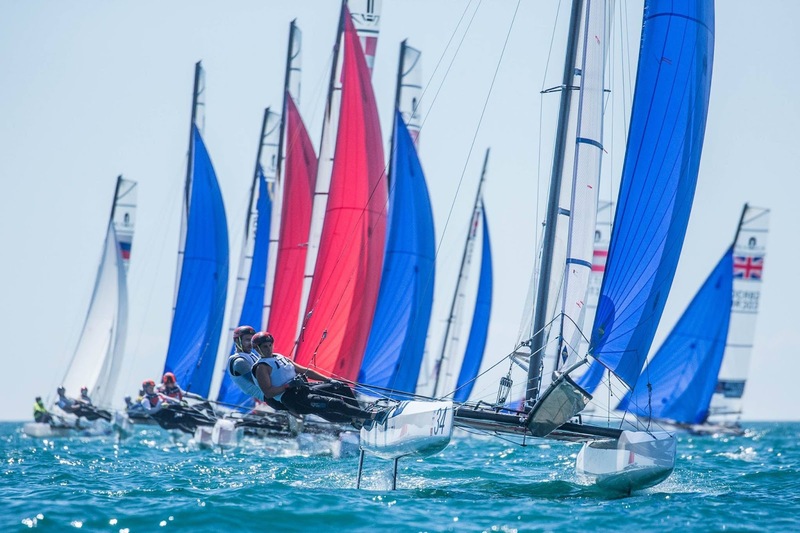 Recently crowned European Champions Ruggero Tita and Caterina Banti of Italy started modestly with two midfleet results and a second place but the Danish winners of the 2018 Sailing World Championships Aarhus Test Regatta, Lin Ea Cenholt and Christian Peter Lubeck came back after a modest 12th place opener to win both their subsequent races. Helm Cenholt commented, “For us we are really happy with our speed on the downwinds and having a lot of fun testing the boat and pushing it and seeing how we can make it a little faster. We might be falling off the foils now and then but it is all about the learning process. We got the boat on the 20th of June and so we did the Europeans and Aarhus. In Aarhus we were just consistent, we did not win a single race but our worst race was a fifth. Today we learned a lot, especially towards the goals which are finding the best settings upwind. Today I think we maybe got a little closer to a faster mode but also we are developing our settings- knowing how powerful the sails need to be set up for this boat.” Racing will start at 1100hrs Wednesday with a forecast for NW’ly breeze in the morning.